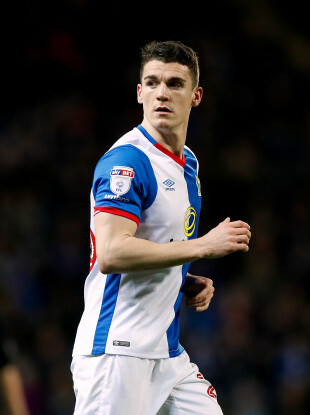 PROMISING IRISH DEFENDER Darragh Lenihan made just his second appearance of the season for Blackburn last night, after returning from a lengthy injury layoff. Lenihan has long been considered a top Irish prospect, representing the Boys in Green at U17, U19 and U21 level, but his progress was curtailed when he suffered a fractured metatarsal on the opening day of the season, which led to surgery in September. The Meath native has been out of action for six months, but after making two appearances for the club’s U23 side, he returned to first-team action last night. The 23-year-old former Belvedere youngster, who is also comfortable playing in midfield, replaced the injured Ryan Nyambe on 57 minutes, slotting into a back three for Tony Mowbray’s side. “It felt brilliant tonight. I didn’t think I’d come on because the boys were doing well,” he told Blackburn’s official site, following a 2-1 victory over Portsmouth at Fratton Park. “After Ryan got injured, I heard my name called and on I went. I felt good. It’s up to me to look after my body now ahead of what will be a rigorous League One schedule. “It’s good to be back. It worked out well for me because the Development Squad played a similar formation when I played for them and I felt really comfortable playing in the back three. Lenihan and Blackburn now face a crucial few months. With two sides gaining automatic promotion from League One, Rovers are third, behind Wigan on goal difference, while they trail league leaders Shrewsbury Town by a point. Former Ireland U21 international Derrick Williams also featured for Blackburn last night, and he has been an integral part of their campaign thus far, featuring 38 times in all competitions. Email “Blackburn's promising Irish defender makes long-awaited comeback after injury nightmare”. Feedback on “Blackburn's promising Irish defender makes long-awaited comeback after injury nightmare”.